Generally while planning a house, we think about how our bedrooms will look like, how are we planning the living rooms, what would be the color schemes for the kitchen, bathrooms are the last thing on the list and are generally compromised either due to less patience or money drains out. But a house interior is incomplete without an efficient bathroom décor. 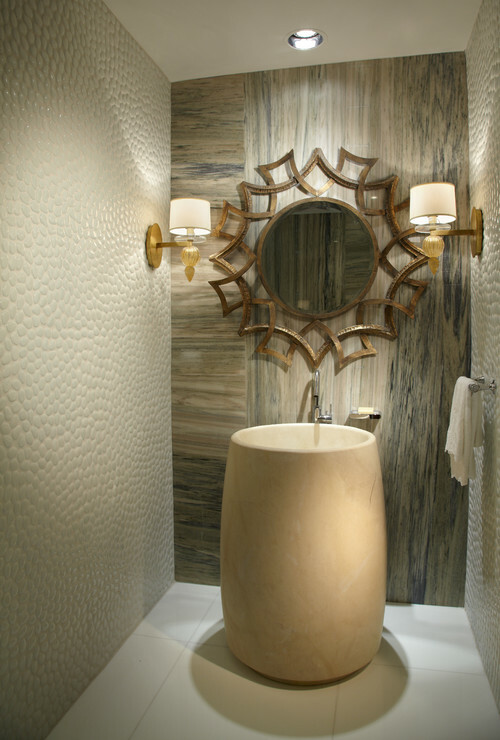 Well Friends, here’re a few ideas and inspirations that can help in getting the right inspiration for your bathrooms. There’s this default perception that bathrooms have to be neutral. Do you really agree? No, Right! Bathrooms deserve an equal right to be colorful as any other space in the room. 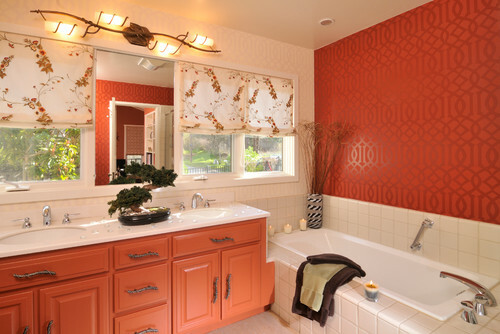 Adding the element of color in a bathroom can bring a lot of styles and amaze in a place like a bathroom! 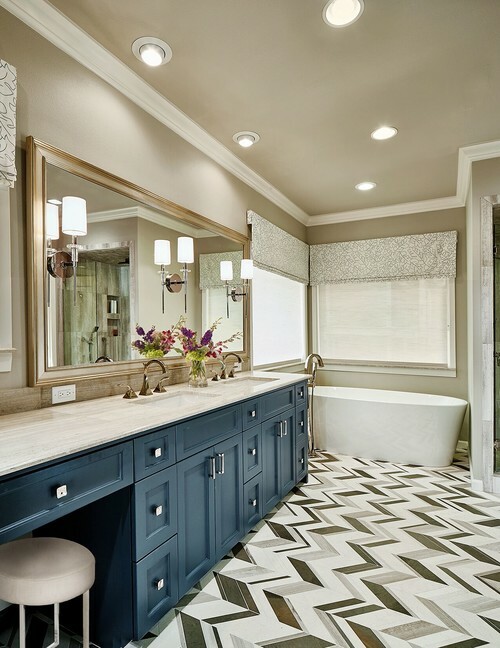 Carefully select the colors and you can literally make your guests drop their jaws by the overall look of your bathrooms. If you want a bold and funky look especially for the kid's bathroom, go for bright and lively colors like in the pictures below. While, if you want it to be simple yet elegant and classy, go for tints and hues of cool colors like blues, greens, purples Get inspired by this image. Once you’ve narrowed down on the color scheme, next comes the selection of tiles from the innumerable options available in the market. 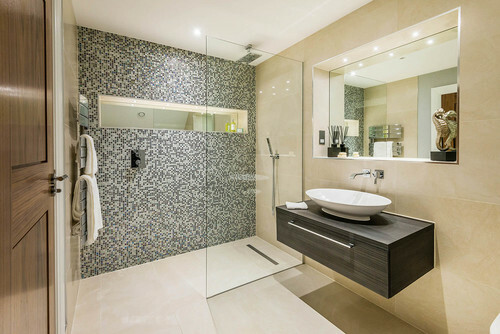 It won’t be wrong to say that tiles do define the character of a bathroom to a large extent. Make up your mind- you want to go for artful or accent tiles or stick to classics. You can go for mosaic pattern playing around with the light and dark shades of colors or maybe some linear, floral or abstract patterns defining the overall geometry. Have a look at the pictures below; they might help you choose a tale that your tiles might narrate. A ledge wall is a low height narrow wall shelf (usually 6'-8') that is protruded from the wall and is created when the cistern is concealed. 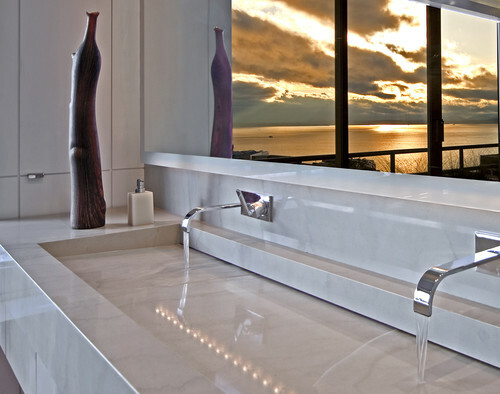 This wall can be iconic for the bathroom space if planned intelligently. This can have both aesthetic and functional role- we can have those small planters or some decorative art pieces kept here or this can be used as a shelf for keeping bathroom amenities. As Mies Van der Rohe has rightly said- God lies in the details. The same thing applies to the bathrooms as well. So make your bathroom more stylish with romantic bathtub designs and bathroom luxury ideas. Even small details like the mirror frames, decorative art panels, hanging lamps, vanity handles or may be as simple as the choice of mixers or diverters and faucets have to be carefully planned in order to give it a full and final touch. Every element in the bathroom should have a purpose and identity adding to the overall character of the bathroom. Mind you these details can make or break the entire look. There are brilliant options available in the market to choose from; you can get some inspiration from the images below. Time has come to rethink, renovate and rejuvenate the bathroom design and break away from the conception of letting the bathrooms compromise! 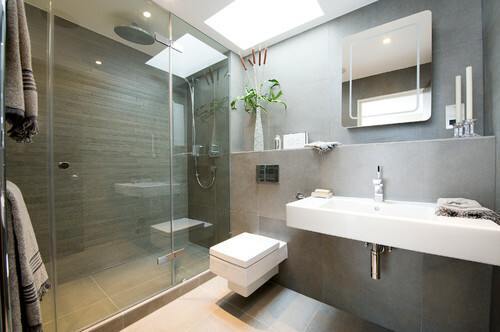 Lastly, take a read of the dilemma about Bathtub vs. Shower, Which is Perfect for Your Bathroom?